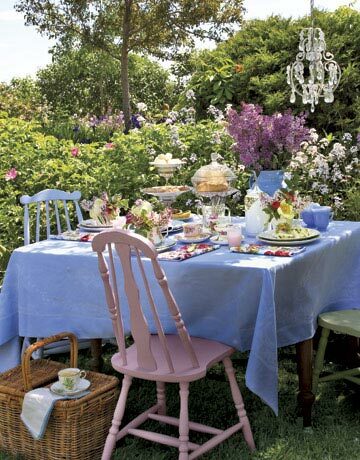 thats a sweet idea to have a garden tea party. I will see, if I can fix up something for that event. From your pretty cups I could only RA Moss Rose identify. But the other are sweet, too. Thank you for planning this fun, for sharing your tea cups and for hosting this sweet event. 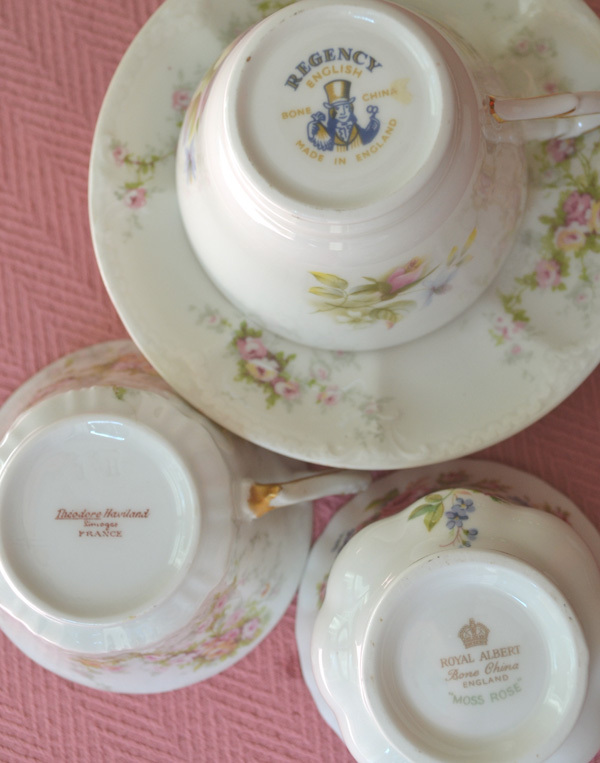 Looking at the handle of the cups, I Got it correctly for the regency cup and royal albert cup. I thought the third one was a limoges. Hope I have time for Tea In the Garden theme. Dear Terri, what a most sweet idea! I love the mismatched setting from Country Living, and I love your beautiful 3 different cups!! I also love myself to deck with mismatched cups or glasses, -and your tea party with old and bargain purchases I`m sure will be a wonderful event ,to follow! Tea in the Garden? It's amazing! Your photo conjures up lovely dreams... What a fun project. I look forward to seeing your version. A tea party in the garden sounds like a good idea and so enchanting. How pretty a tea area would be of linens and lace. What pretty teacups and visions! I guessed two them; Limoges and RA. Love the table garden setting! I am looking forward to your Tea in the Garden over the next few weeks. Have a beautiful day. It's always better to use your imagination rather than cash! PS Any chance you'd consider losing the word verification? It certainly slows down commenting. Terri, Your teacups are so beautiful! So happy to be partying with you today. Thanks for hosting! Lovely Lovely tea cups - and I love the idea of tea in the garden - I'm beginning to plan already. What a pretty garden setting to get you dreaming! And a fun idea for the Garden Tea Party. I'm going to see if I can pull something together! Congratulations for the opening image you chose for this post and for that idea of the Tea in the Garden party. I'll try to find something to join in. 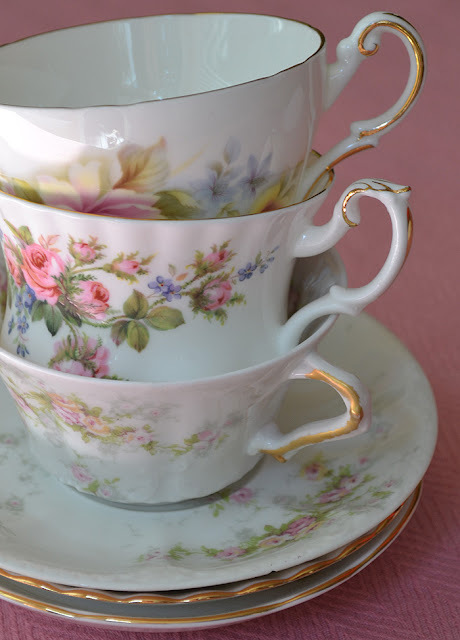 As to this week´s beautiful cups, I had the right guess for the Royal Albert one and that's all :). Thanks for the fun and the lovely tea. I love your fantastic idea, and I know you willcome up with something amazing, because you are amazing! I will have to be an onlooker on this one, but I know I will enjoy it. I have alwsys dreamed of this myself, both indoors and out, so I will live vicariously thru you! A garden tea party would be fun. I've been to a couple that were really nice but the weather has to cooperate too. I have a panel of sheers saved from the days of draperies in our home because I've been dreaming of uses for it outside. Us tea ladies are romantics at heart. Tus tazas de té siempre son una maravilla, y la forma en que las presentas: todo tan bello y mágico. Gracias por venir a mi argentina, amiga, por hacerme un lugar en tu mundo. Please don't change this because of me. I think it is great and I will sure participate in yours!. I started doing Tea In The Garden on Saturdays in 2009 after beginning my garden in 2008. Today is my 41st one (but I'm not into that numbering thing). I love it if we all do it! Hi Terry! What a wonderful idea. I can't wait to see what you come up with. I know it will be lovely! How funny, you know that first picture of yours? It is/was the vry first Pinterest pin I ever did way back when....when Facebook was necessary to pin things........and I "borrowed" my daughters account because I didn't and never will have FB......what a fun coincidence. I absolutely adore that picture and still have it in my files, though I never did pin it with my own Finch Rest pin account. I love your idea and will definately plan on joining! All so sweet and pretty, just like you, dear Terri! un thé au jardin ? quel bonheur! mais je n'ai pas de jardin! Ok I want to play too! We just got a new picnic table and it is a great start! Looking forward to some fun! I love that outdoor tea party. So amazing. I will see what I can come up with. I don't have a tea cup to share today. Just came by for a visit. 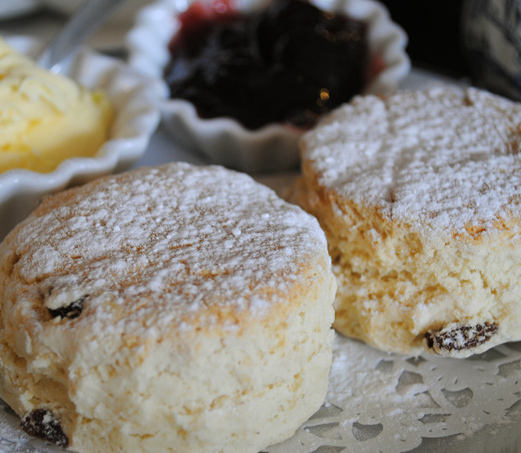 I am so excited you will be hosting a garden tea party! I will be thinking of a special tea for you! I just hope we get some warm weather soon! We are so behind everyone else. My daffodils are just now starting to bloom! Thank you for hosting and have a great week! I think I will have to join in on this, as it is most definitely my CUP OF TEA ! This is exciting Terri, and thank-you. Thanks so much for stopping by! Spring is a wonderful season. I followed The Tablescaper's link to your party & felt I just had to join in, as my teacup in my post is made by the same company as one of your beautiful ones...the Regency one! Tea in the Garden sounds like such a lovely idea, too. Your photos & commentary are wonderful. I think this must be my first visit to your blog, but certainly won't be the last. It is always so lovely to visit you dear Terri...your garden party sounds wonderful! Oh, I can't wait to see what you come up with Terri. I know it will be enchanting! It all sounds divine, Terri...I'm looking forward to it. I'm sure with your imagination and creativity it will be beautiful and fascinating. Your teacups are so pretty and feminine. This sounds marvelous, Terri! I think there are so very many creative ways we can use what we have. I am looking forward to joining you then. I may be at the beach, but I'll be prepared! I have the same problem with spam, so enoying!! Love that picture with the mismatched chairs.I can't wait to see your party. I am totally certain it will be something to see! What a lovely idea Terri. The inspiration table and setting is so pretty. I love how the chairs do not match. Great event, love it. Beautiful blog! Im a new follower and i wanted to join in, the Tea Cup Tuesday. I was just wondering if im supposed to post just in my blog? or how does it work?